Magical tablescapes don’t create themselves. Whether you’re hosting the wedding of your dreams, a backyard bash or an intimate evening soiree, table linens are the foundation of your event’s décor. At your next gathering, let the dinnerware, glassware and centerpieces shine on top of perfectly coordinated table clothes, table runners and cloth napkins. With help from our friendly staff, you can easily set the perfect table that expresses your style and stays on budget. Tablecloths are a big part of your overall décor because they provide the base to your theme. 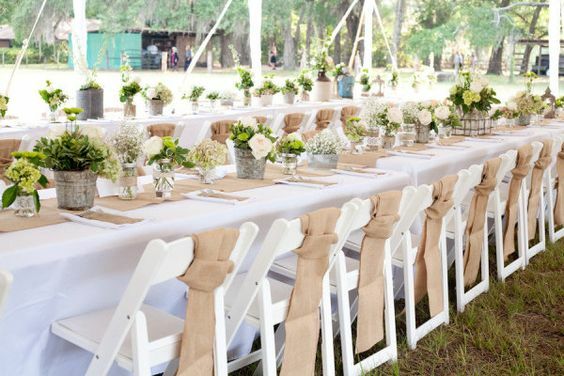 You can choose plain white tablecloths and load them up with accents like colourful runners, napkins and floral arrangements. 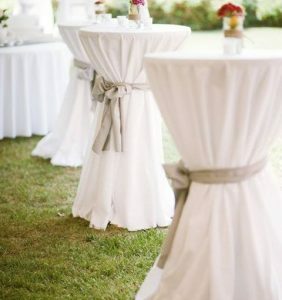 Or, you can pick an exciting pattern or texture and have your tablecloth steal the spotlight! Table runners can completely transform the feeling of your table. They’re a great way to make a bold statement and lay the foundation for your centerpiece. The options are endless—they even provide some structure and interest on a gorgeous wooden table that you couldn’t possibly cover up. The last, and definitely not least, aspect of your table linens are the napkins. Coordinated with either your tablecloth or your table runner, napkins bring together the elements of décor and are a functional piece of the puzzle. Whether they’re folded into amazing shapes, laid out as a simple rectangle fold with a paper menu napkin ring or folded with a pocket to tuck place cards into, napkins add visual interest without a lot of extra cost or design work. No matter what you’re planning this year, let your tables stand out with our clean, freshly pressed table linens. We offer a wide selection of colours, shapes and sizes and provide professional delivery and pick-up anywhere on Vancouver Island. Browse our extensive selection of table linens and other event rentals here. Give us a call at 250-871-4646 or email info@relayevents.ca to arrange everything you need to create the most tempting tablescapes. If you prefer, stop by our showroom at 2-1255 McPhee Avenue in Courtenay, where you’ll always find our friendly, experienced team happy to help you plan the perfect table setting.